“Personal development is important. We have to have a good attitude, be positive, have goals … but most people who join networking already have that. They are missing the skills to get the job done. This site contains our affiliate links to Big Al merchandise at Big Al Books and Amazon. If you make a purchase from this site, you’ll be supporting Big Al and Bob and Anna, but more importantly, you’ll be supporting yourself and your team on your path to MLM and Network Marketing success! We’ve been fans of Tom ‘Big Al’ Schreiter for years, and have attended every workshop we could get to. Tom tells us that we can get motivated, set goals, build vision boards, and improve our attitude all day long, but unless we learn the skills, we are roadkill! We’d often hear Tom refer to “The Twenty Five Skills” and we asked him a few times what those skills were. It looks like many others have asked the same, as Tom has finally released his list of the twenty five most important skills for a network marketer to learn. Whether you are a newbie or seasoned MLM veteran, you’ll be amazed at your success when you apply a few of the principles you’ll learn from these resources. 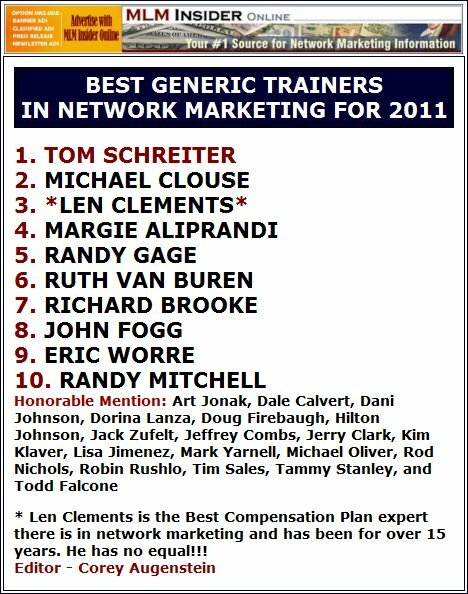 Click on the pic above to see Tom rated as Number One MLM Trainer of 2011 in the voting at MLMInsider! Big Al’s 25 MLM Skills List – Free! To view all 25 skills on one convenient page, click on Tom’s eggshell blonde head to the right. Download the handy one page pdf and share the list with your friends and team members. This is an excellent way for you and your whole organization to get started and keep going! Big Al’s MLM Skills Test – Free! Take this short MLM Skills Test to see how well prepared you are for success! Learn what skills you need to learn to pass on to your downline. Instructive and fun!It’s also an excellent guide to listening to Tom’s training. Print and keep it handy. Fill in the blanks as you learn and progress. For better marks on the test and a bigger check in your mailbox, you can cram for the test right here with some of Tom’s training below. Happy prospecting! Take a moment to read what others are saying about Big Al’s training sessions. These aren’t gurus or super stars or heavy hitters or MLM rock stars. These are regular people like you and us trying to make some extra money in network marketing. Big Al makes sense and he makes a difference in our lives by making a difference in our incomes. Are You Walking Past A Fortune? Free Ebook! “People do network marketing every day, but they just don’t get paid for it.” Tom Big Al Schreiter. ‘Are You Walking Past A Fortune?‘ is a terrific mini-booklet that convinces your prospects that they should collect a network marketing check. Tom wrote this prospecting booklet back in 1987. Perfect for handouts, but now here it is in PDF format so that you can send it via email to your prospects. Why You Need to Start Network Marketing: How to Remove Risk and Have a Better Life – Free Kindle Book! The easiest way to spread your message. Order your copy now by clicking on the clock! Big Al simplifies things for us once again. Here’s a recent insight that gave us a bit of a surprise. “Which skills should we give our new distributors first? If our new distributor lacks confidence, then learning the four colors of personalities is the obvious choice. However, out of the 25 basic skills, four skills will be needed immediately by almost every new distributor. After all, how many skills do new distributors have when they sign the distributor agreement? None! Creating rapport so that prospects believe us. Breaking the ice and introducing our business in a socially acceptable way. Closing. Getting the prospect to make a “Yes” decision. With Big Al’s 2 CD package, you will learn The Secret Language of Prospects, that INSTANTLY goes to their minds and to their hearts so that you can say just a few sentences and your prospects will want to join! By just changing a few words and a few sentences into the secret language that your prospects understand, everything will change in your business. And the change will be spectacular. Lots to learn between the laughs! These CD’s are part of Big Al’s Library 1 and Big Al’s Big Library. Of the 25 skills, this one is the most fun and the first skill that new distributors should learn. Why? Get ready to smile and achieve quicker rapport and rapid results. Here are five common-sense ideas that will help. Our initial goals need short timelines. Our initial goals should be small to build our confidence. We must understand our personality style and set our goals to match. Our goals must match our core values. We can use mini-habits instead of will power to reduce stress. Why continue to feel guilty about failing to reach our goals? We can reach our goals and find success by following the ideas in this book. Click on the pic to get your copy now! Too frightened to talk to prospects? Looking for a place to practice your secret language skills? Why not start with your kids? Or your nieces and nephews or your neighbor’s kids? After all, kids are just mini-prospects, right? Then teach this skill to your kids too. It will help then get along with other kids, their teachers, the world! And … they’ll have a great head start on their road to entrepreneurship. Click on the YES! to get your copy now! Learn how to get a presentation appointment with 100% of the prospects you talk to. Discover how to give your prospects a COMPLETE presentation in only one minute! You can turn your business around overnight by learning just this one skill. This CD set is part of Big Al’s Library 1. Where do I start? What do I say? I don’t want to sound like a salesman. How can I relax my prospects? When we are untrained, giving presentations can be difficult. We don’t know the real questions in the minds of our prospects. We can’t see the big picture because we are drowning in facts. And the big picture is simply this: Does the prospect want to join our business or not? But what would happen if we changed our entire approach? First, we’ll learn to get appointments with almost 100% of the people we talk to. Next, we’ll learn to give our entire business presentation in less than one minute. Our prospects will be thrilled! We’ll save time for ourselves and for our prospect. That will make two people happy! And we’ll have the flexibility to give our presentation anywhere at any time. Sales tension will disappear when our prospects know our presentation will take only one minute. Learn to make your business grow with this efficient, focused business presentation technique! In less than two minutes, our prospects will move forward, ready to join. This presentation requires no flipcharts, videos, research reports, testimonials, PowerPoint slides or graphics. All it takes is a simple two-minute story that we customize for our prospects. Forget all those boring presentation information dumps of the past. Instead, let’s talk to our prospects in the way they love. And for us? We will love helping prospects see what we see, so they will ask to join our business. The two-minute story is the best way to help your prospects to join. Order your copy now! For many distributors, the hardest part of prospecting and presenting is the first sentence. If the first sentence is good, the prospect becomes interested and engaged. If the first sentence is bad, it is hard to recover the prospect’s interest and confidence. Discover many types of successful, fun first sentences in this book that get positive engagement from prospects. You want your prospects on “your side” when presenting. You can’t start with a second sentence, so your first sentence better be good! Ice Breakers and First Sentences are included in Big Al’s Super Sponsoring Workshop package. These Super Sponsoring Workshops were professionally recorded, and this Big Al audio CD program has the best material from his Super Sponsoring Workshops. The one-hour section on “How to develop your first sentence” is priceless. You’ll learn why the first sentence causes your prospect to lean forward with a high level of interest and desire – or why your first sentence sets you up for failure. Wouldn’t it be nice to have a great first sentence that was so powerful that it didn’t matter how well you conducted the rest of the presentation? Think of how a great first sentence would help your downline overcome the fear of approaching people. Plus five more CD’s containing much, much more! Ice Breakers and First Sentences in The Super Sponsoring Workshop are now part of Big Al’s Library 2, a great value. Do you want to meet and bond with new people easily? Instantly remove fear, shyness, and rejection? Follow these little formulas for stress-free introductions and conversations with strangers. Instead of dreading that first encounter, we will look forward to meeting new people and engaging them successfully. Think of the power we will have to create new contacts, new networks, new business, and new friends. And we can use this skill anywhere, anytime, on-demand when we need it. Meeting new people will be fun and profitable! Click on the high five to order your copy now. These CD’s from the all day London UK session called “How to Quickly Build Your Network Marketing Organization.” will teach you how to get appointments easily, give a complete presentation in just one minute, find the real reasons your prospects join, turn negative prospects into positive, answer objections before they are raised, and build rejection-free by learning just one simple sentence! Invest a couple of hours in yourself now to save yourself years of failure and frustration later! These CD’s are now part of Big Al’s Library 1, a ‘must-have’ collection! This book shows the beginner exactly what to do, exactly what to say, and does it through the eyes of brand new Distributor Joe. Big Al takes brand new Distributor Joe and teaches him a very basic system and a magic script to get to 100 distributors fast and rejection free. This is the original book Big Al wrote to build his business in the late ’70s. He has updated it with the exact scripts to get every new distributor started fast. They will love the easy way to get their first distributor within hours. This is probably the #1 sold book in all of network marketing throughout the world. Published as Big Al Tells All (Sponsoring Magic) in 1979, and revised in 1985 and 1999, this latest revision includes updates to match the changes in the network marketing industry. It still retains the classic techniques (and Big Al’s humor) that are essential to successful network marketing. Pre-closing is natural. We make a final decision to go to a movie, before we see the movie. We make a final decision to go to a restaurant before we see the menu. It is the same with sales presentations. Prospects decide first if they want our business or product, before they see our facts, features and benefits. Click on the pic to order your copy now! Selling is fun when we know how to do this. Make retailing a pleasant experience while building your network marketing business. Plus, every satisfied retail customer now believes in your product or service. What a great group of qualified prospects to potentially become members of your team! Click on the pic to order your copy now. Getting “Yes” Decisions: What insurance agents and financial advisors can say to clients. What does this mean to us in real life? No more convincing, proving or information dumps. Instead, we will allow our prospects to willingly volunteer to do business with us, before we even propose solutions. Enjoy this clear and fascinating journey into our potential clients’ minds. Discover why the old school sales techniques of the 1980’s no longer work. Our prospects are over-marketed to, subject to constant advertising, and can search for their own solutions online. But none of this matters when we do our job of guiding them through the minefield of insecurity and doubt. Can we master these new words, phrases, and five questions quickly? Of course we can, and this book shows how. Before they make their list of prospects, before they learn how to talk to people and even before they learn the One-Minute Presentation, your new distributors must know the Needs vs. Wants principle. Help your new distributor understand the difference between needs and wants. This principle eliminates the fear of contacting people and directs your new distributor to great prospects. No more wasting time, no more frustration, no more rejection! Listen to Big Al explain why this skill is the first one anyone should learn. This CD is part of Big Al’s Library 1. This is CD #2 from Big Al’s MLM Sponsoring Secrets album. How do people think? In words or pictures? If a picture is worth 1,000 words, this means that if you can communicate with “word pictures”, you will be transferring information from your brain to their brain 1,000 times faster! If your prospect now sees what you see, your prospect will make the same decision. In this CD, you will learn the magic of word pictures and how to instantly transfer your vision to your prospects. This is better than an opportunity meeting and it gives you instant results! Listen to Big Al explain why this skill is way above the other 24! This CD is now part of an excellent skills collection Big Al’s Library 2. Are you looking for prospects for your business? Would you like a presentation that rises way above the competition? Want to know what really motivates prospects to act? These rejection free marketing strategies and fascinating case studies and stories are taken from Tom “Big Al” Schreiter’s 40+ years experience in network marketing. Powerful sound bites that compel prospects to act now. How to keep the undivided attention of prospects. How to get the best prospects to raise their hands and beg to do business with you. Word-for-word exact phrases to say. Step-by-step easy-to-follow descriptions of what to do. The greatest networkers in the world use great marketing to rise above the masses of frustrated marketers with no one to talk to. Network marketing and MLM is all about dealing with people. Use these techniques to stand above the competition and bring those prospects to you. This CD set is a wonderful bargain on its own, and is also part of Big Al’s Library 1. Big Al teaches us how to use stories to make the biggest sale of all – getting your prospects to want network marketing in their lives. If you accomplish that, it is e-a-s-y. Learn the grocery story that gets everyone to think big – how they can clean up in network marketing. Learn the missing Social Security check story that creates that massive “fear of loss” that gets people to act now. You’ll see the imaging power of this story, and you’ll want to use stories every chance you get. There are many great stories on ‘Stories To Help Your Prospects Believe’ that are easy to learn, easy to tell, and totally rejection-free. This CD is part of Big Al’s Library 1, essential skills for you and your team! In network marketing, the easiest and most comfortable way to prospect, sell and sponsor, is with a story. Facts are boring. Everyone represents a company with great facts. Our prospects have heard that all before. Become a professional story teller and join the top earners now. These Super Sponsoring Workshops were professionally recorded, and this Big Al audio CD program has the best material from his Super Sponsoring Workshops. The one-hour section on “How to develop your first sentence” is priceless. You’ll learn why the first sentence causes your prospect to lean forward with a high level of interest and desire – or why your first sentence sets you up for failure. Wouldn’t it be nice to have a great first sentence that was so powerful that it didn’t matter how well you conducted the rest of the presentation? Think of how a great first sentence would help your downline overcome the fear of approaching people. Plus five more CD’s containing much, much more! This 6 CD collection is part of Big Al’s Library 2. In The Secret Language of Prospects, Big Al takes the confusion out of our most important job – talking to people. There are just four basic types of people you’ll be meeting – yellow, blue, green and red – the teddy bears, the chimps, the owls and the sharks. Don’t alienate an owl by promising parties. Don’t irritate a shark by singing Kumbaya. It sounds silly, but most distributors never bother to learn the language of their prospects. We might as well be speaking Latin to Lutonians. The result is alienation and rejection, and another NO to add to the pile. The most important thing we do is talk to people, and the most important time is the first ten seconds. Why not learn how to create instant rapport by speaking in a language our prospects understand? If you’d like to dramatically increase your team’s recruiting success rate, you’ll want to learn this skill and pass it on to your downline. These CD’s are part of Big Al’s Library 1. Instant Rapport On The Telephone – Free Audio and Transcript! You can apply the Secret Language skills to any situation – online, on the street, on the phone. On the phone is where most of us spend our time, so why not learn the skills to build instant rapport just by having a conversation? Big Al interviewed Tom Paredes, a telephone-recruiting superstar. Distributor-prepared flyers, ads, infomercials, etc., all make pretty much the same claims. Tom Paredes has a business changing technique that blasts through all this sameness. The CD is no longer available, but you can still get an mp3 version! If you’d like to learn Tom Paredes’ special techniques for making prospects want to be on the telephone with you, just click here for the free recording and transcript of Telephone Techniques That Work. How To Get Instant Belief, Trust, Influence and Rapport! We offer great products to prospects. We say great things to people. We share our vision and passion with others. And they don’t buy, they don’t believe us, and they don’t share our vision and passion and they don’t trust us. We need to learn how to get people to believe and trust the good things we are saying already. It’s all about the magical first few seconds when we meet people and they make an instant decision to trust and believe you. If you are a leader, a network marketer who needs to communicate quickly and efficiently, this book is for you. If we don’t capture the attention of our audience during the first few minutes of our presentation, we’ve lost our opportunity to win them over. Whether it’s a speech, a presentation, a webinar or even a casual conversation, we have just a few seconds to prove our value. How can we capture our audience’s instant attention and support? By mastering our first 20 seconds, we can compel our audience to lean forward and eagerly accept our message. By using any of the three major openings in this book, we can confidently start our speeches and presentations without fear. Whether you are making a presentation to a crowd of hundreds, or to just a few prospects, you need these techniques to get your speech off to a great start. Mark Davis and Tom ‘Big Al’ Schreiter have given thousands of successful presentations. Let them teach you to do the same! When you run out of friends, family and your warm market, how are you going to find hot, local prospects? You can build a huge local business, right near your home now. And, you don’t have to worry about rejection, calling cold leads, or other uncomfortable ways of trying to build a business. Big Al will teach you these easy to implement skills – the fishbowl technique, the night school technique, the bird dog method, and many other great ways to locate awesome prospects right in your hometown. Where To Find Hot, Local Prospects For Your Network Marketing Business, part of Big Al’s Library 1. In this book you will learn the best places to find motivated people to build your team and your customer base. So instead of searching and wasting time, you can get right to the very people who want your business and products. Whether you choose the Stair-Step Technique, the Bird Dog Technique, or a Promotion Party, you will actively fill up your calendar with great appointments for your presentations. Just pick one that is comfortable for you and start building today! Prospects have to think it over, review the material, or get another opinion. This is frustrating if we are afraid to follow up. What can we do to make our follow-up efforts effective and rejection-free? How do we maintain posture with skeptical prospects? What can we say to turn simple objections into easy decisions for our prospects? Prospects want a better life. We have the opportunity to be the guiding light. Use the techniques in this book to move your prospects forward from “Not Now” to “Right Now!” Click on the pic and get your copy now! Attract, educate, and sponsor more prospects into your MLM opportunity. 8-CD training program PLUS 4 bonus CDs containing the Live In London workshop recording! Want to sponsor more distributors? Want to sponsor better distributors? Want to build an incredible large and stable MLM organization? Now you can! How? By using some of Big Al’s common sense techniques like the magic of word pictures, bypassing the conscious, opportunity meeting tips, the power of events, finding true leaders, motivational and confidence building tips, the power of stories, first sentences, getting referrals, handling objections, encouraging decision making, and much much more in Big Al’s MLM Sponsoring Secrets! This 12 CD set is part of Big Al’s Library 2. Instead of wishing and hoping for leaders, these books will give you the step-by-step activities to actually create and train leaders. These are the perfect books to lend to a new distributor who wants to build a long-term MLM business, and would like to know exactly how to build it. The return on your investment is paid over and over again. And the earnings from developing one good leader could dwarf the monthly payout of almost any retirement plan. Build your network marketing business faster now. Want to motivate your network marketing team into action? We don’t have to be screaming drill instructors to get the job done. Through contests, recognition, goal-setting, fill-out forms, personal development and other motivational techniques, we can do our part to create momentum in our teams. Our new distributors need motivation to overcome the negativity of their initial prospects. Our experienced distributors need motivation when they run out of prospects they know. Learn the motivational values and triggers of our team, and learn to use them wisely. By balancing internal and external motivation methods, we can be more effective. As leaders, we need to be the spark that ignites our team into action. We can teach our team exactly what to do. However, we must motivate them to do it. Enjoy this book of case studies and examples of exactly how to be a motivating team leader. We can’t do all the work ourselves. We need help. Our teams have to be in action for us to duplicate. Put your team into momentum and get results fast. Click on the bullseye to get your copy now! No one is a “natural-born leader.” Babies aren’t given a manual on how to be an adult. Adulthood is learned from others. By showing, participating, experiencing … and of course, sharing stories. Inside this book, you will find many ways to change people’s viewpoints, to change their beliefs, and to reprogram their actions. And when these three things change, the results will naturally change too. We don’t have to be a screaming drill instructor to get the job done. Through contests, recognition, goal-setting, fill-out forms, personal development and other motivational techniques, we can do our part to create momentum in our teams. Enjoy this book of case studies and examples of exactly how to be a motivating team leader. We can’t do all the work ourselves. We need help. Let our subconscious minds build our network marketing business. How? Through the power of automatic habits. Here is our chance to use habits to create a powerful stream of activity in our network marketing business. Consistent, automatic activity in the right direction = momentum. Start your team off right with these three powerful habits. Make their success inevitable. Click on the big 3 to the left and get your copy now! Want to add some humor to your next network marketing training? Need a good laugh? Want to tease your worthless sponsor? Here is a collection of worthless sponsor jokes from 25 years of the “Big Al Report.” These jokes are meant for fun, not to be mean. So don’t share them with humor-challenged individuals. Network marketing can be enjoyable, and we can have fun making jokes along the way. The journey is the experience. Let’s have a great journey. So read, laugh, and enjoy some good bedtime reading that will put a smile on your face. Order your copy now! Big Al on Facebook – Where Leaders Gather! Join Big Al and dozens of network marketing/MLM leaders on Facebook. Ask your questions and get answers that work from industry professionals and leaders in their field. No question too easy and no question too tough! You’ll get instant access to this professional forum and tons of tips and expert advice. It’s almost like getting a university education in network marketing without the high university tuition fees. Join Network Marketing Questions today! It’s free! Free Training Audios and Big Al Report! More freebies from Big Al! The Big Al Report: You’ll receive a free weekly email with tips, ideas and more magic words to build your business FAST! Just visit SponsorFastWithBigAl.com or click on the pic to the right, fill in your email address, and you’ll get all these freebies delivered to your inbox right away. Are you ready to explode your network marketing business? Big Al’s Library Volume 1 contains some of his most popular audio products and reports. See for yourself how easy network marketing can be, once you learn the skills. Network marketing doesn’t have to be hard. Quit struggling in your business. Learn the skills, earn the big checks! Big Al’s How to Quickly Build Your Network Marketing Organization London Conference 2001. Big Al’s Learn the Secret Language of Prospects (Colors). Big Al’s How to Manipulate and Control the Minds of Others for Fun and Profit. Big Al’s Needs vs. Wants. Big Al’s Stories to Help Your Prospects Believe. How To Find Hot Local Prospects. It’s time to get your business rolling toward the bonus checks you’ve always dreamed about. Get started here. Are you ready to continue your network marketing education? Big Al’s Library Volume 2 contains some of his most popular studio-recorded audios plus his entire live Super Sponsoring workshop. See for yourself how easy network marketing can be, once you learn the skills. Network marketing doesn’t have to be hard. Quit struggling in your business. Learn the skills, earn the checks! It’s time to get your business shifted into overdrive and earn the bonus checks you’ve always dreamed about. Change gears here. If you are serious about your business and want to become a true leader with a full time income and a prosperous team, this is the package for you. Now you can learn every magic sentence, every story technique, every presentation, every ice breaker, every recruiting tip, every sponsoring skill and more, and you can pass them on to your partners. This is the best way to learn the “how-to” skills necessary to move you to a full-time income, and then to the big incomes you and your team dream about. Learn proven, tested, exactly-what-to-say methods to build your organization fast. Get inside your prospects’ heads, and speak directly to their hearts and minds. An additional four bonus CDs. Are you still struggling in your network marketing business? It’s time to get the tools you need to make your business a success! Get it ALL here.